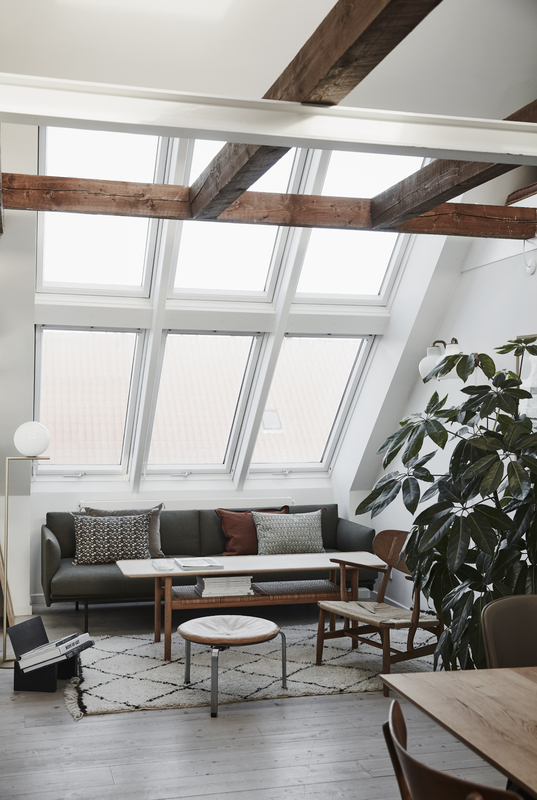 Overlooking Copenhagen roofs, a two floor rooftop flat is transformed into a quiet oasis for a brought together family. 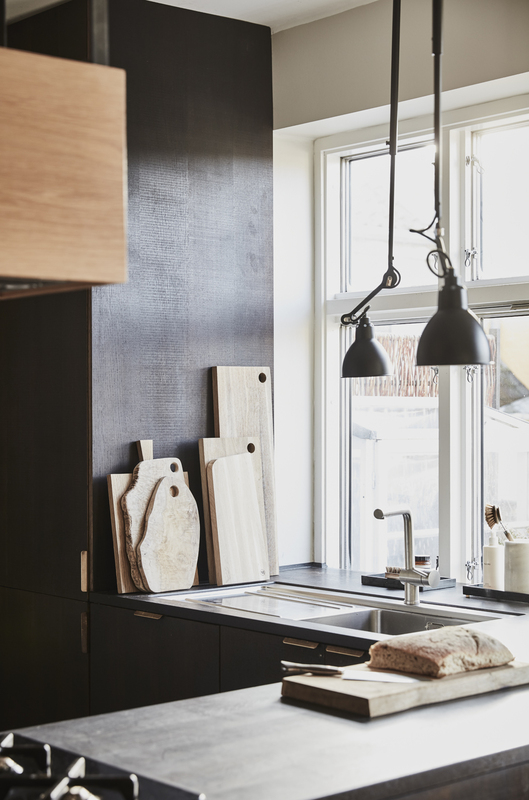 Modern design and Danish classics are stylish mixed by PR-manager Line Borella to a modern home for herself, her boyfriend Martin Holmboe and their assembled children. “When I met Martin he already lived in the apartment here in the colourfull, lively and multi ethnic spot in Copenhagen, Nørrebro. 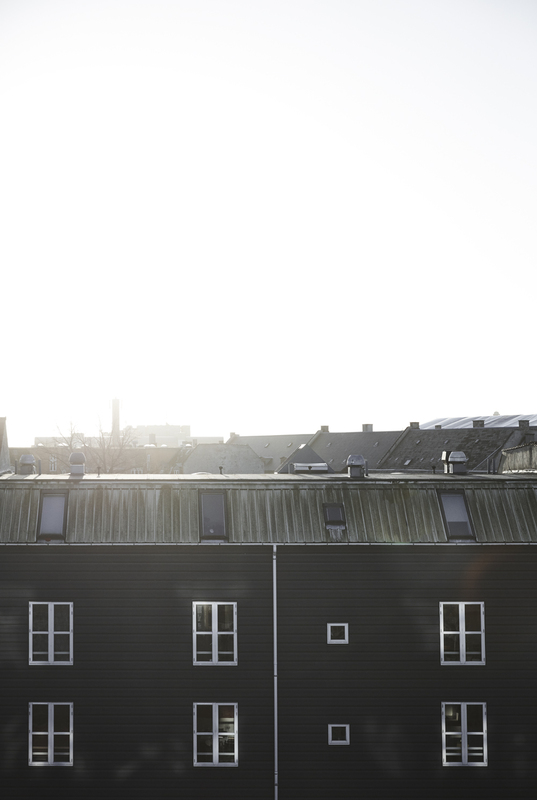 It took us no time to decide that here was the opportunity to create a new community for us and our children, says Line Borella, International PR Manager in the Danish designcompany Menu, who lives here with Martin Holmboe, Investment Manager and their four assembled children at 6, 8, 11 and 14 years. The flat is on top of the old building. From the main door you enter directly into the bright kitchen- and dining area. The windows is generous with daylight into the apartment of 140 square meters, divided into two levels. The lower level consists of a small entrance hall, a combined kitchen-dining area and two large children’s rooms. 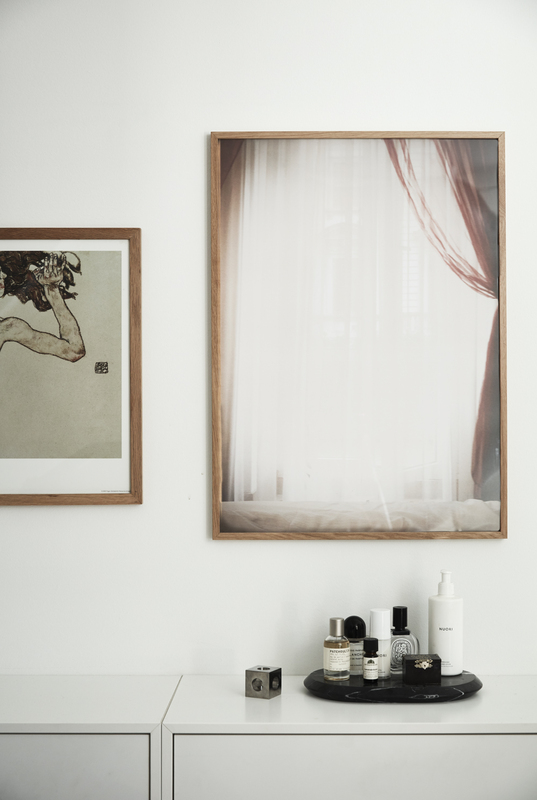 In addition, a very, very small bathroom, only 1.5 square meters large and typical of old Nørrebro apartments. It needs to be extended and refurbished soon. 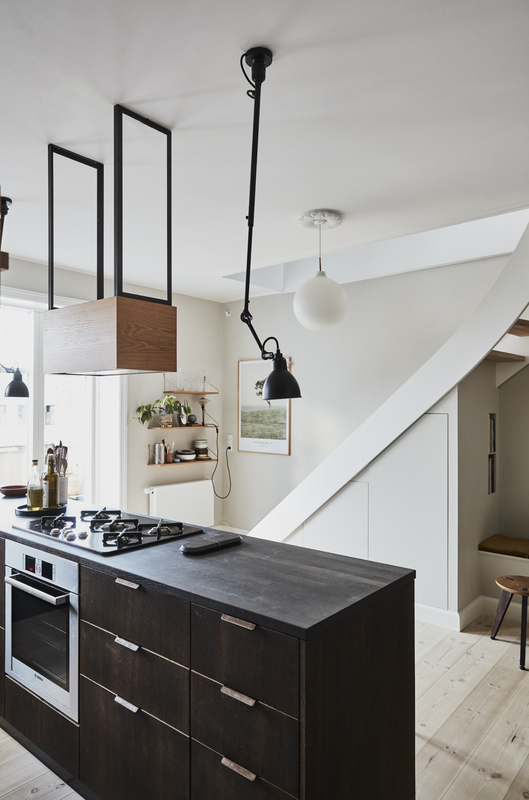 A staircase leads to the top floor where the living room with living- and dining area is, bedroom and children’s room as well as a narrow staircase up to a small loft used for “hygge”, watching television and cosy enjoyment. Originally the room with the exposed beams was ceiling for drying clothes for the property’s former residents, but in order to get more room for both parents’ room and an extra children’s room, Martin Holmboe himself has set up partitions with sliding doors to use the least amount of space. In the corner below the stairs is a small dining area is just enough place when the family of 6 is dining . Table and stools are designed by Roon & Rahn. The bench and closet for storage under the stairs has Martin Holmboe himself built. A cavity is utilized for a few shelves for the cookbooks. From the small entrance you enter directly into the kitchen from danish kitchen-company Reform, designed by Norm Architects, built on kitchen modules from IKEA. The dark wood is smoked oak with handles in browned tombak, the table top is massively smoked oak. The hood is designed by Wooden Mind. 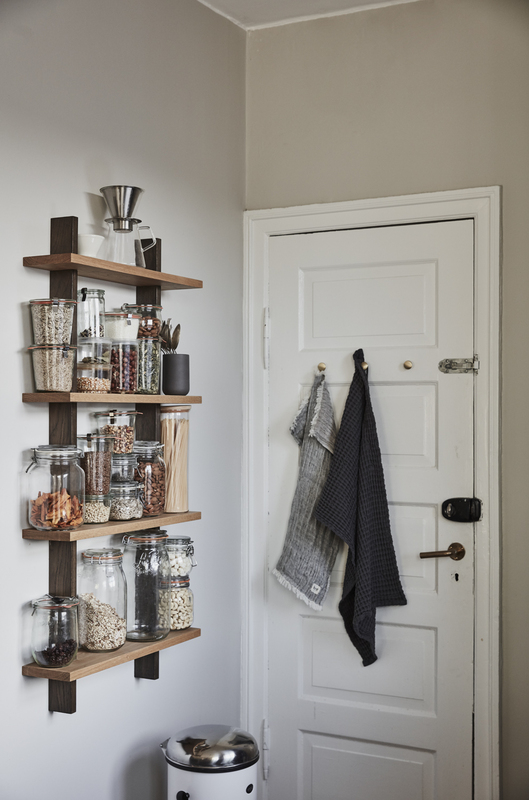 Under the stairs, Martin Holmboe has taken advantage of the space and built cabinets for storing all the things that dosen`t look good. The dark kitchen stands in beautiful contrast to the light that flows in form the patio door. Line Borella likes bowls and plates in ceramics and it does not matter if they are different when the table is set. Steel pitchers from Stelton and Georg Jensen. Table lamp from PH, Louis Poulsen. 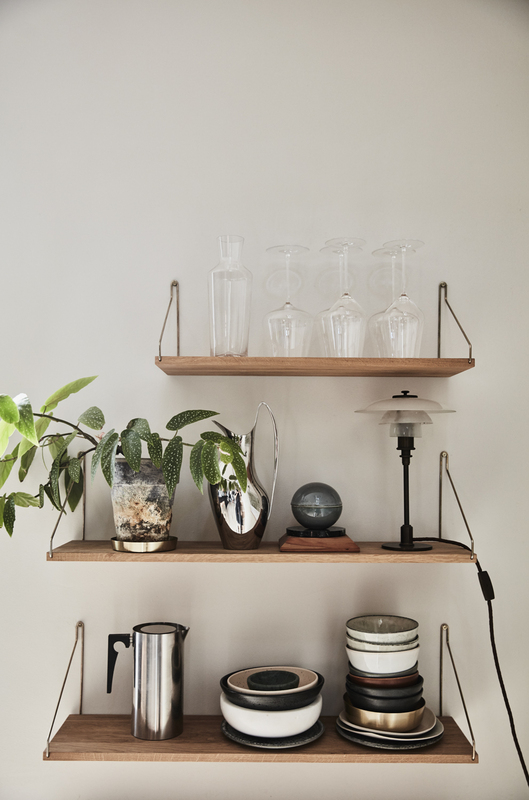 The shelves in teakwood and brass is from Frama. A collection of light wood cutting boards forms turns a nice contrast to the dark oak tree. In the windowshade, a few small wooden slabs keeps brushes and soaps on track. 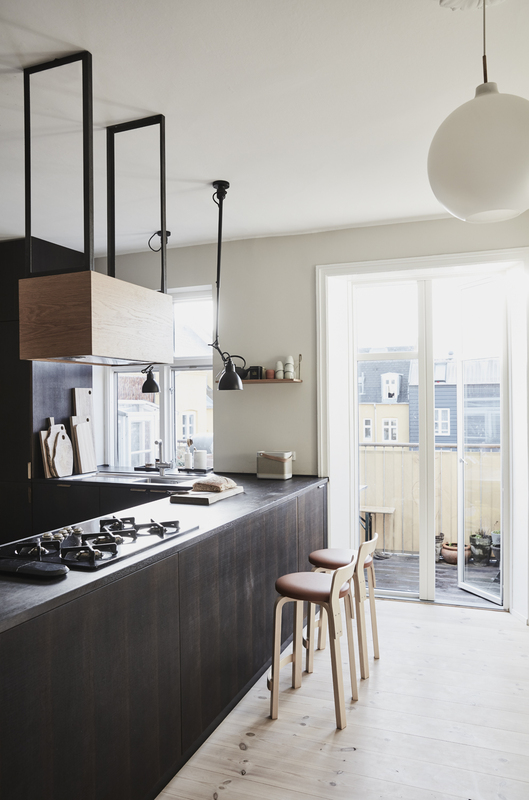 The kitchen is from Reform, designed by Norm Architects, built outside standard IKEA kitchen modules. The dark wood is smoked oak with handles in browned Tombak, the table top of solid smoked oak that stands in beautiful contrast to the light soap-treated floors. The hood is designed by Wooden Mind and emphasizes the simple expression. From the kitchen there is access to one of the apartment’s two balconies, where the food is often taken out on sunny summer evenings. Bar chairs designed by Alvar Alto by Artek. The space is used for storage. On narrow shelves are glasses with dried beans, nuts and grains visible. 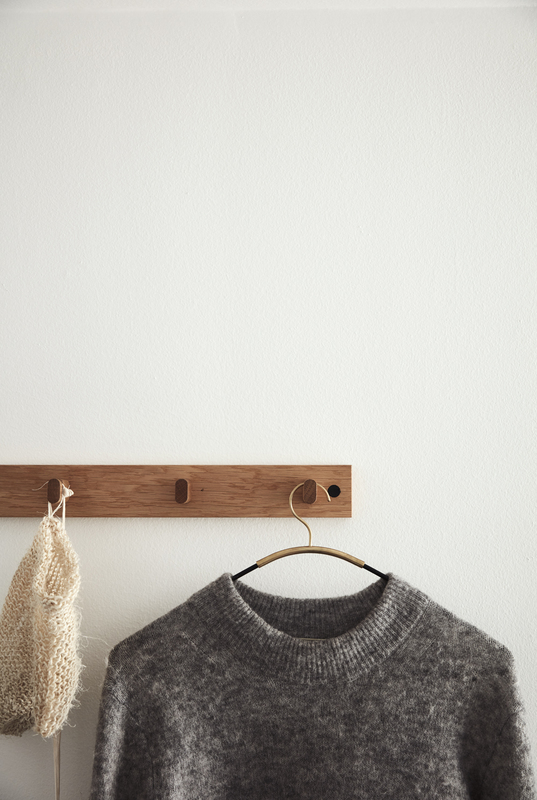 The door of the backstroke has got three brass knobs from Muuto, dishtowels from Ferm Living and Organic Company hang. Pedal bin from Vipp. One enters the kitchen directly from the small entrance hall, with just room for a bench and coatrack. The small mirror with brass frame is from Menu. During the refurbishment of the kitchen, all walls were painted with beige Lime Lady from Jotun. The matte surface emphasizes the white windows and doors and gives the daylight a soft and sensual cut. The dark kitchen appears as an elegant and sculptural piece of furniture, when not in use. 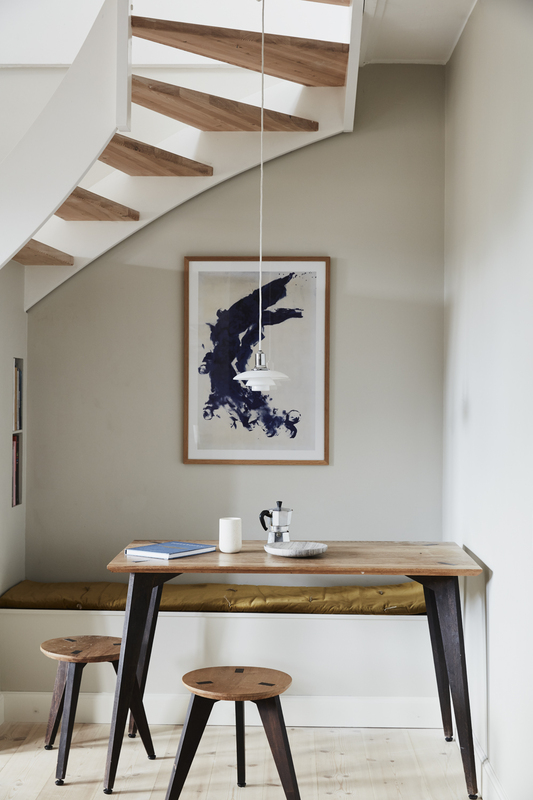 The wall of the staircase is painted in fullmat Charleston Gray from Farrow & Ball. Around the dining table is a mix of wooden and tile chairs designed by Hans J. Wegner, who Line Borella has inherited from her parents, the cushioned chair is Synnes Dining Chair by Falke Svatun for Menu, a new piece from the 2018-collection. The dark beams has been allowed to stand raw, the cat`s favorite spot in the sunlight. The dining table is from Roon & Rahn, the carpet is Moor Rug in the hand woven wool from &Tradition. In the background there are books, decorations and the recordplayer on shelve from Mau. The black lamp is Mantis, the small table lamp in brass from Menu. The dining area under the beams overlooking a small balcony and Nørrebros rooftops, collects family and friends. When the sun rises directly through the large glass area, the room functions like an conservatorie/orangerie, large green plants love it here. The dining table is from Roon & Rahn, carpet Moor Rug from & Tradition. The chairs designed by Hans J. Wegner are heirlooms from Line Borella’s father. Chair Synnes Dining Chair by Falke Svatun for Menu. Table lamp Snoopy from Flos, designed by Achille and Pier & Giacomo stands on a marble display from Menu. Glass and ceramic vases on the table are from Menu. Books stimulates and inspire, a selection of culture, architecture and designbooks. The small table lamp in glass and matt polished brass is from Menu. The wall by the stairs is painted in Charleston Gray from Farrow & Ball. The apartment of 140 square meters is in two levels plus a samll loft right below the beams. A music corner with piano and guitar is suited here by the stairs. 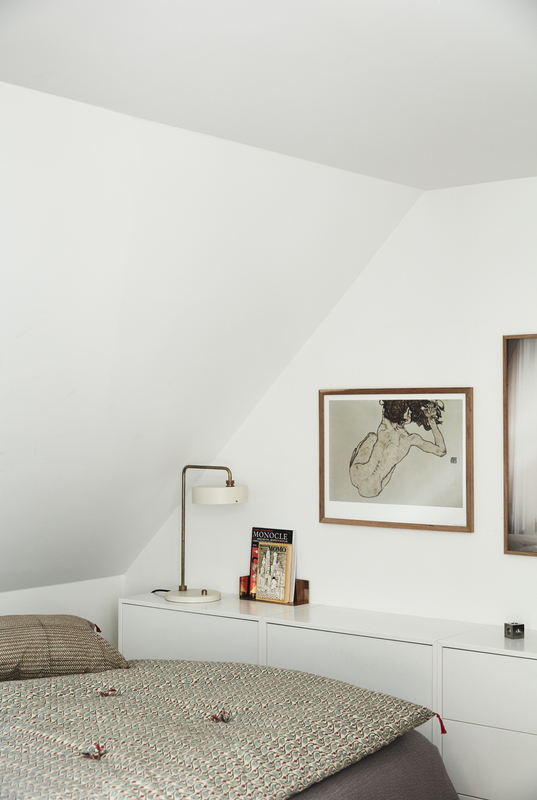 Picture from Objects of Copenhagen, white lamp from Flos, designed by Erwan & Ronan Bouroullec. 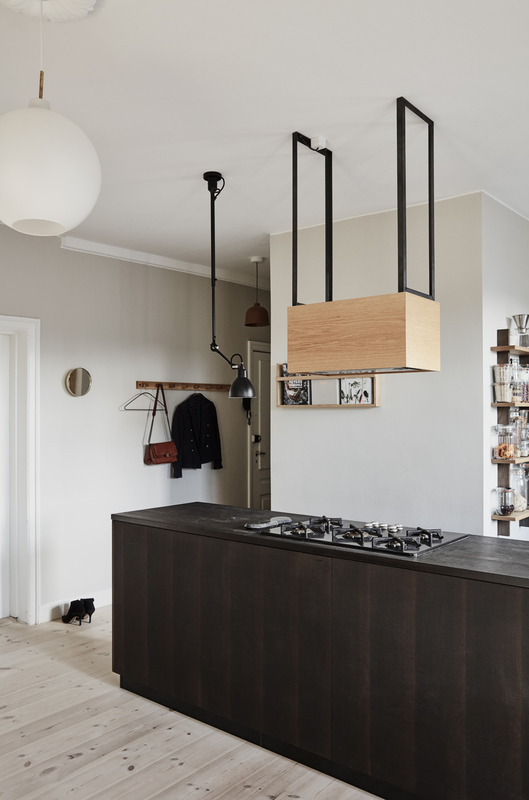 The pendant over the dinigtable is from Louis Poulsen. Under the slanted windows is the relaxing part of the home, with Muuto’s sofa and pillows in patterned textile from Caravane Paris. Floor lamp in brushed brass from Flos, designed by Michael Anastassiades. The stool of Poul Kjærholm, coffee table and armchair in wood and braided by Hans J. Wegner. Some of the family’s many designbooks is displayed in the small architectural artwork in steel and marble, Monuments Magazine holder, designed by Dubokk for Menu. Line Borella and Martin Holmboe have been looking for quality and solid crafts as they decorated their common housing. The natural materials goes thorugh the hole interior and are emphasized with thick carpeting and upholstered furniture. The table is designed by Roon & Rahn, chairs in wood and wood is Wegner, upholstered Habour Chair Series, designed by Norm Architects for Menu. In the bedroom, the perfumes are on a tray of solid marble from Menu. The room has no windows, the photographic artwork from Paper Collective gives a strong visual effect as a window with lightflow through the curtains. The bedroom is simply furnished. The sloping walls make it impossible to have large closets, therefore there are chests of drawers throughout the length of the room. A half wall is built into the room and serves as a walk-in closet for clothes, shoes and bags. On the bed quilted carpet blanket and pillow from Caravane Paris. The table lamp is Petite Machine, from Made By Hand. Øverst oppe med udsigt til byens tage, er to etager lige midt på Nørrebro i København, forvandlet til en rolig oase midt i storbyens puls. Moderne design og danske klassikere er stilfuldt mikset i Line Borellas lejlighed der danner rammen for en sammenbragt familie. ” Da jeg mødte Martin boede han i lejligheden. Det tog os ingen tid at beslutte, at her var muligheden for at skabe et nyt fællesskab for os og vores børn, fortæller Line Borella, International PR-manager hos det danske designbrand Menu der bor her i den 140 kvadratmeter store lejlighed sammen med kæresten Martin Holmboe, Investment Manager samt deres fire sammenbragte børn på 6, 8, 11 og 14 år. Fra hovedøren træder man direkte ind i det lyse køkken-alrum. Her allerøverst oppe kaster vinduerne et særligt lys ind i boligen, fordelt på to plan. Nederste etage består af en lille entré, et kombineret køkken-alrum og to store børneværelser. Desuden et meget, meget lille badeværelse, kun 1,5 kvadratmeter stort og typisk for gamle Nørrebro-lejligheder. Det skal udvides og istandsættes inden længe. En trappe fører op til øverste etage hvor stue med opholds- og spiseafdeling er, soveværelse- og børneværelse samt en smal trappe op til hemsen som bruges til læsning og TV-hygge. Oprindeligt var etagen med de fritlagte bjælker tørreloft for ejendommens beboere, men for at få flere rum og gøre plads til både forældresoveværelse og et ekstra børneværelse, har Martin Holmboe selv sat skillevægge med skydedøre op. I krogen under trappen er der indrettet en lille spiseplads hvor familien på 6 lige akkurat kan sidde. Bord og taburetter er designet af Roon & Rahn. Bænken og skab til opbevaring under trappen har Martin Holmboe selv bygget. Et hulrum er udnyttet til et par hylder til kogebøgerne. Fra den lille entre kommer man direkte ind i køkkenet fra Reform, designet af Norm Architects, bygget udenpå køkkenmoduler fra IKEA. Det mørke træ er røget savskåret eg med greb i bruneret tombak, bordpladen er i massivt røget egetræ. Emhætten er designet af Wooden Mind. Under trappen har Martin Holmboe udnyttet pladsen og bygget skabe til opbevaring af alt det der roder. Det mørke køkken står i smuk kontrast til lysindfaldet fra altandøren. Line Borella kan godt lide skåle og tallerkener i keramik og det gør ikke noget at de er forskellige når bordet dækkes. Kander i stål fra Stelton og Georg Jensen. Bordlampen er PH fra Louis Poulsen. Hylderne i teaktræ og messing af Frama. En samling lyse skærebrædder i træ danner en fin kontrast til det mørke egetræ. I vindueskarmen holder et par små træbakker orden på opvaskebørsten og sæber. Køkkenet der er fra Reform, designet af Norm Architects, er bygget udenpå køkkenmoduler fra IKEA. Det mørke træ er røget savskåret eg med greb i bruneret Tombak, bordpladen i massivt røget egetræ der står i smuk kontrast til de lyse, sæbebehandlede gulve. Emhætten er designet af Wooden Mind og understreger det enkle udtryk. Fra køkkenet er der udgang til den ene af lejlighedens to altaner, hvor maden ofte tages med ud på lune sommeraftener. Barstole designet af Alvar Aalto, produceret af Artek. Pladsen er udnyttet til opbevaring. På smalle hylder står glas med tørrede bønner, nødder og korn til skue. Døren til bagtrappen har fået tre messingknopper fra Muuto hvor viskestykkerne fra Ferm Living og Organic Company hænger. Pedalspand fra Vipp. Man træder direkte ind i køkkenet fra den lille entre hvor der lige akkurat er plads til en bænk og knager til overtøjet. Det lille spejl med messingramme er fra Menu. Under istandsættelsen af køkkenet blev alle vægge malet med beige Kalk fra Jotun Lady. Den matte overflade fremhæver de hvide karme og døre og giver dagslyset et blødt og sanseligt skær samt fremhæver det mørke køkken så det fremstår som et elegant og skulpturelt møbel når det ikke er i brug. 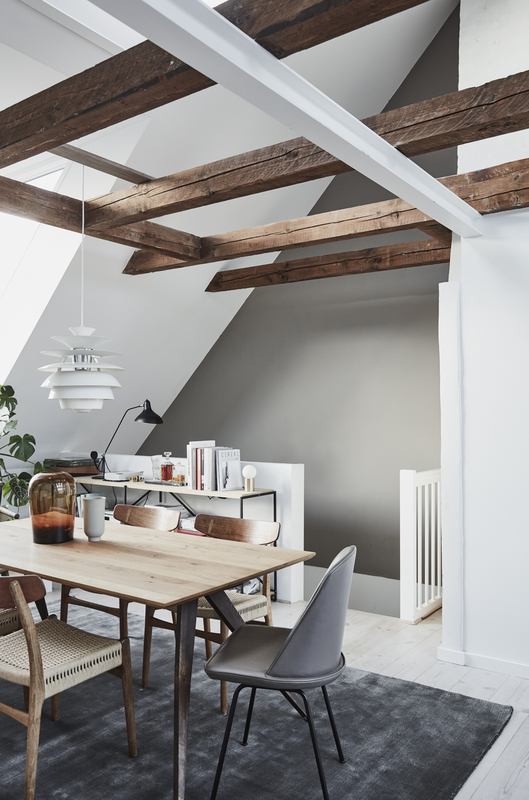 Væggen over trappen er malet i helmat Charleston Grey fra Farrow & Ball. Omkring spisebordet står en blanding af stole i træ og flet, designet af Hans J. Wegner, som Line Borella har arvet fra sine forældre, polstret stol for bordenden er Synnes Dining Chair, design af Falke Svatun for Menu og en del af den helt nye 2018-kollektion. De mørke bjælker har fået lov til at stå råt, det er kattens yndlingsplads. Spisebordet er fra Roon & Rahn, gulvtæppet er Moor Rug i håndtuftet uld fra &Tradition. I baggrunden står bøger, nips og pladespilleren på reolen fra Mau. Den sorte lampe er Mantis, den lille bordlampe i messing fra Menu. Spiseområdet under bjælkerne med udsigt til en lille altan og Nørrebros tage, samler familie og venner. Når solen står direkte ind gennem det store glasparti, fungerer rummet som et orangerie, store grønne planter til stortrives her. Spisebordet er fra Roon & Rahn, gulvtæppet Moor Rug fra &Tradition. Stolene designet af Hans J. Wegner, er arvestykker fra Line Borellas forældre. Får bordenden polstret stol for bordenden er Synnes Dining Chair, design af Falke Svatun for Menu. Bordlampe Snoopy fra Flos, designet af Achille og Pier & Giacomo står på marmorsokkel fra Menu. Glas- og keramikvaser på bordet er fra Menu. Bøger stimulerer og inspirerer, her et udvalg om kultur, arkitektur og design. Den lille bordlampe i glas og matpoleret messing er fra Menu. 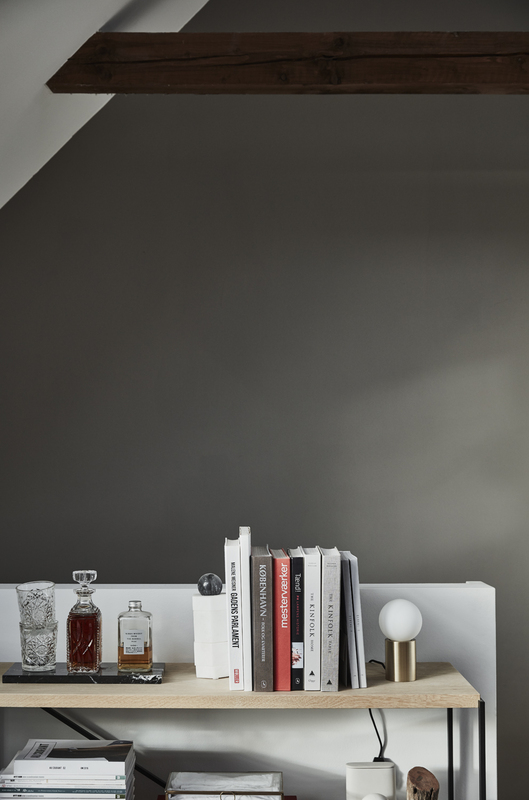 Væggen over trappen er malet i Charleston Grey fra Farrow & Ball. Lejligheden på 140 kvadratmeter er i to plan plus en hems helt oppe under bjælkerne. I krogen ved trappen til hemsen for hygge og TV, er indrettet musikhjørne med klaver og guitar. 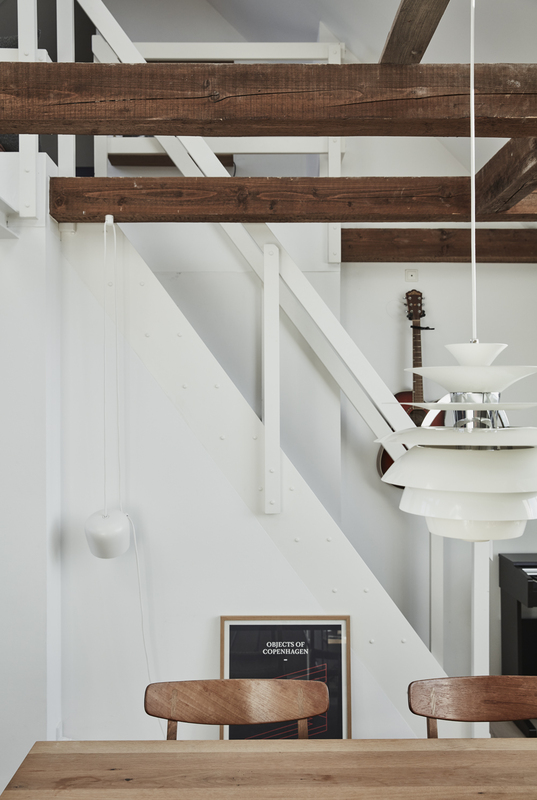 Billedet op trappen er Objects of Copenhagen, hvid lampe fra Flos, designet af Erwan & Ronan Bouroullec. Pendel over bordet er PH Kuglelamel fra Louis Poulsen. Under de skrå vinduer er hyggehjørnet med sofa fra Muuto og puder i mønstret tekstil fra Caravane. Gulvlampe i børstet messing fra Flos, designet af Michael Anastassiades. Taburet af Poul Kjærholm, sofabord og lænestol i træ og flet af Hans J. Wegner. Nogle af familiens mange designbøger opbevares det lille arkitektoniske kunstværk i stål og marmor, Monuments Magazine holder, designet af Dubokk for Menu. Line borella og Martin Holmboe er gået efter kvalitet og gedigent håndværk da de indrettede deres fælles bolig. Naturmaterialerne går igen overalt og fremhæves med tykke gulvtæpper og polstrede møbler. Bordet er designet af Roon & Rahn, stole i flet og træ er Wegner, polstret stol Habour Chair Series, design af Norm Architects for Menu. I soveværelset står parfumerne fremme på en bakke i massivt marmor fra Menu. Rummet har ingen vinduer, derfor giver billedet på væggen fra Paper Collective en stærk visuel effekt af et vindue hvor lyset strømmer ind gennem gardinerne. Soveværelset er helt enkelt indrettet. De skrå vægge gør det umuligt at have store skabe, derfor er der placeret kommoder i hele rummets længde. En halv væg er bygget ud i rummet og fungerer som walk-in skab til tøj, sko og tasker. På sengen quiltet tæppe og pude fra Caravane. Bordlampen er Petite Machine, fra Made By Hand. Line Borella omgiver sig med design både privat og på sin arbejdsplads som International PR-Manager for designvirksomheden Menu. Her står hun for at brandet er præsenteret i førende design- og interiørmagasiner verden over, samt er ansvarlig for kontakten til presse, influencers og kommunikation på de sociale medier.